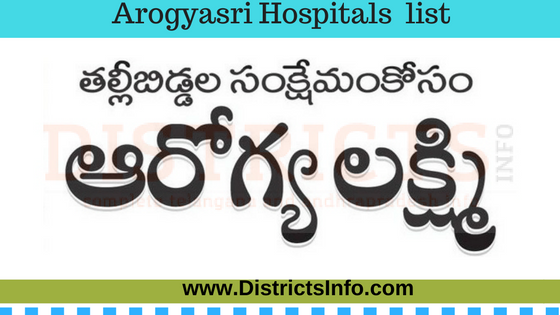 Arogyasri hospitals lists Private and Govt : Aarogyasri Scheme was launched by Sri Late Y S Rajasekhar Reddy, the then chief minister of united Andhra Pradesh. Aarogyasri scheme was launched in Telangana in the year 2007. Poor people can get financial protection up to Rs. 2 lakh in year under this scheme. The objective of Aarogyasri is to provide poor people with quality medical care. Many treatments are covered under this scheme. The diseases that are covered by Aarogyasri scheme in Telangana are heart problems, liver, pancreas, kidney, congenital malformations, cancer treatment, polytruama and many more. Recently Telangana government also brought liver transplantation under Aarogyasri. Poor people can get this surgery do without spending a rupee in government hospitals. This Arogyasri hospitals list Private and Govt applicable following Telangana districts :Adilabad, Bhadradri Kothagudem, Hyderabad, Jagtial, Jangaon,Jayashankar Bhupalpally,Jogulamba Gadwal, Kamareddy, Karimnagar, Khammam, Kumuram Bheem, Mahabubabad,Mahbubnagar,Mancherial Medak, Medchal, Nagarkurnool, Nalgonda, Nirmal,Nizamabad,Peddapalli,Rajanna Sircilla,Rangareddy,Sangareddy,Siddipet,Suryapet Vikarabad,Wanaparthy,Warangal (Rural),Warangal (Urban),Yadadri Bhuvanagiri in the Telangana State. This Arogyasri hospitals list Private and Govt applicable for following andhra pradesh Districts East Godavari, West Godavari, Krishna, Guntur, Prakasam, Sri Potti Sri Ramulu Nellore, Srikakulam, Vizianagaram, and Visakhapatnam, Kurnool, Chittoor, YSR Kadapa, and Anantapur these districts of Andhra Pradesh state in India.